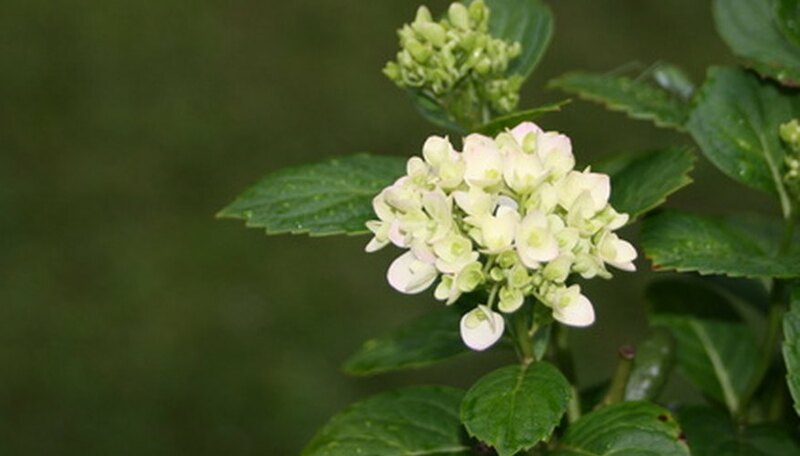 Climbing hydrangea is a plant that is highly revered in the world of vines for its strong growing skills, large fragrant white flowers that grow up to 10 inches in diameter, dark bark and glossy leaves. This vine variety grows best on a tree or brick wall since it uses aerial rootlets to support itself. It does not grow well on fences, and is not so aggressive that it will take over the wall of a house or kill a tree. When training a climbing hydrangea, there are important things to keep in mind such as training the shoots and pruning. Choose an adequate location for the climbing hydrangea. The side of brick walls or trees (preferably oak) are ideal, or even crawling over rock beds. The location must be in full sun. Plant young hydrangea transplant vines at the base of the structure you are training it on. Dig a hole as deep as the transplant root ball, and spread out the roots as you set it in the hole. Backfill the soil and tamp it lightly down around the base. Water generously. Stretch the new shoots up so that they are making contact with the support surface, using plant tape (available at your local nursery) to secure them. This helps start the process of training the climbing hydrangea upward, eventually anchoring itself. Continue to guide the shoots and vines in the direction you want them to go, usually upward and slightly outward to cover a surface. Use plant tape lightly if necessary, but usually training them with your hands will help them anchor themselves on items such as trees or rocks. Secure the shoots with galvanized nails on a surface that goes straight up, such as a brick wall. Secure nails at 24-inch intervals to tie the shoots to as they grow upward. This is an ideal way to completely cover a wall with the climbing hydrangea. Prune the climbing hydrangea only if it is growing in a direction or way you do not desire. Prune in late winter when the vine is dormant.